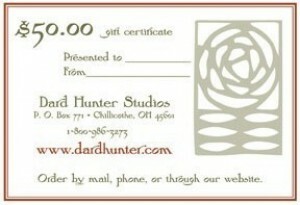 These Dard Hunter gift certificates are great for any occasion. Weddings, anniversaries and birthdays, would all be great times to order these gift certificates for someone special. They are available in $25, $50, $75 and $100 amounts.